Contract Exteriors, a growing exterior remodeling company headquartered in Murrells Inlet, South Carolina is selected as one of the top 50 contractors in the country by REMODELING magazine. 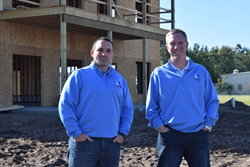 Randy Hann and William McCourt, owners of Contract Exteriors, have been selected by REMODELING magazine to join the REMODELING Big50. The Big50 awards will be presented at a gala dinner at the Remodelers Summit and Awards Gala on Oct 25-27 in Kansas City, Mo. The 2016 Big50 winners are featured in the May issue of REMODELING, a national trade publication read by more than 130,000 professional remodeling contractors, with longer profiles of the winners posted on the REMODELING website, remodelingmag.com. “This designation validates that our unwavering commitment to quality and customer experience has helped our company become an industry leader, while allowing us to continue to add and grow offices along the coast,” says William McCourt, Vice-President of Contract Exteriors.